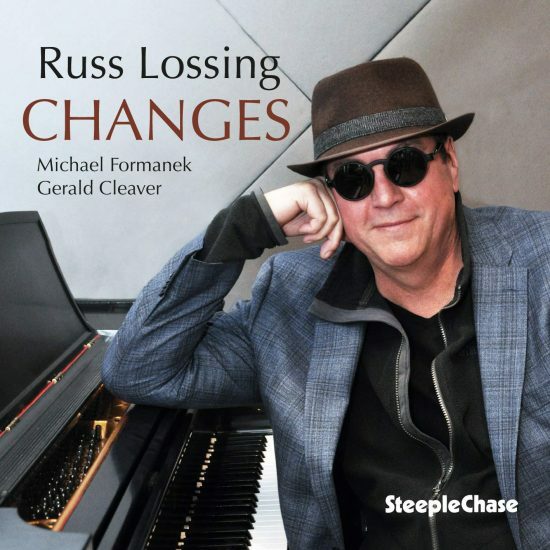 Russ Lossing’s career is centered on writing and playing his own music, but he’s intermittently addressed our ever-growing jazz canon with the kind of insight that can only be honed by decades of improvising. Check the pianist’s takes on Sonny Rollins’ “Pent Up House,” Andrew Hill’s “Awake,” or Paul Motian’s “Dance” for a clear view of how the work of others can be keenly renovated. Particularly memorable is a 2004 lilt through Charlie Parker’s “Dexterity” with a forlorn attitude that nonetheless allows room for a boppish patina honoring Bird’s frenetic contours. On this new trio date, Lossing dedicates the bulk of the program to covers of well-known titles, and his refractions are both shrewd and inviting. Including three Monks, two Dukes, a few standards, and an original that sounds like it could be clipped from some overlooked Powell or Pullen book, Changes uses mainstream fare to provide the leader and his rhythm section of Michael Formanek and Gerald Cleaver enough leeway to nurture new elements from the melodies and twist the rhythms toward locales where overt swing makes hay with looser elaborations. Like those of Tom Rainey’s Obbligato outfit, Lossing’s bend-and-stretch inversions are cagey enough to keep listeners guessing while delivering the comforts of familiarity. Ellington cast a bittersweet mood with “Reflections in D,” and the trio milks its dreamy atmosphere with a wealth of nuance. “Epistrophy” gallops and glides; “Bye Bye Blackbird” waxes wooly but resolves refined; “Little Girl Blue” sanctions a handful of harmonic idiosyncrasies. The trio sounds more mature than this debut date should be—there’s an immersive quality to the music. As Changes spills forward, we learn about the artists’ vision as well as the pliability of the material the trio has chosen.